Physicians for the Prevention of Gun Violence (PPGV) has grown to over 200 members in 2014 and includes the heads of eight medical departments. We also have medical students, physician assistants, and nurse practitioners. Initially we appealed to local mayors to join Mayors Against Illegal Guns (MAIG), a national group of over 600 mayors headed by Michael Bloomberg of New York. Ann Arbor Mayor John Hieftje, Ypsilanti’s Paul Schreiber, and Saline’s Gretchen Driskell joined. PPGV has continued contact with MAIG and with the Brady Campaign, the two national groups active in this issue. We met local law enforcement and work with the sheriff and local government officials. PPGV also joined the local panel for the Ann Arbor screening of the documentary movie ‘Living for 32’ about the Virginia Tech shooting deaths of 32 students. In fall of 2012 we brought David Hemenway, PhD, gun injury expert from Harvard University, to address Ann Arbor physicians at Saint Joseph Mercy Hospital, University of Michigan Hospital, and the public. PPGV established a website and blog. We have given several grand rounds. PPGV presented at the Washtenaw County Medical Society (WCMS) and wrote an article for their publication. Together with the WCMS we wrote successful resolutions to the Michigan State Medical Society on gun violence. We are planning to work on legislation when feasible and on visiting other communities to encourage new physician groups to form. PPGV Accomplishments • After Tucson in Jan 2011, some PPGV members joined Mayors Against Illegal Guns, a national organization of mayors to decrease gun violence headed by NYC Mayor Bloomberg, and also the Brady Campaign. • PPGV members helped bring the movie “Living for 32,” about the Virginia Tech slayings to the Michigan Theater in Ann Arbor and served on the panel discussing the movie , (9/11) • PPGV succeeded in getting three local mayors (Ann Arbor, Ypsilanti, and Saline) to join Mayors Against Illegal Guns, (10/11) • Mayor Gretchen Driskell of Saline went on to win a difficult battle for a seat in the Mi. House. 11/12 • PPGV recruited physicians from Family Medicine, Emergency Medicine, Surgery, OB, and Pediatrics at St. Joseph Hospital, as well as physicians from Human Growth and Development, Family Medicine, OB-Gyn, and Pediatrics at the U-M. • PPGV also began to recruit medical students and supportive community members and formed an executive committee of physicians and community members (summer 2012). • PPGV brought national gun violence expert David Hemenway, Ph.D. of Harvard to UM and St. Joe for meetings with physicians and community members, 9/12. • PPGV and the Washtenaw County Sheriff’s office discussed partnering in a gun buyback. (Summer, 2012) • PPGV members met with the Washtenaw County Medical Society (WCMS), and attended the WCMS legislative candidates meeting to question candidates on gun issues (Fall 2012). • Drs. Walden and Zweifler wrote an article for the Washtenaw County Medical Society Journal on PPGV and Gun Violence (10/12) • PPGV members joined state-wide opposition to Senate Bill 59 that would have allowed concealed weapons in schools, churches, bars, and other public places; fortunately Gov. Snyder vetoed this bill just after the Newtown tragedy (12/12). • Members of PPGV spoke in Lansing against a law to eliminate the Gun Registry, also opposed by Mayors Against Illegal Guns, Women’s Groups, and the State Police. Fortunately, we were successful in maintaining the Gun Registry (12/12). • PPGV launched a Website: . (12/12) • PPGV began soliciting membership dues of $50/year. $25 for Retirees,students, non-physicians. 1. Meet after Virginia Tech 2007 and decide to try to do something. 5. Try to add med students. A few join, and more focus needs to be placed there. 6. Visit Pediatrics, St. Joe’s . Chris Elkins adds 25 members with department head, Errol Suskolne. Dan McMurtrie, head OB also joins. 7. Present at E.R. and Surgery at St. Joe. Drs. McCurdy and Whitehouse department heads, respectively, join. Feb. 2012. 8. Make contact with David Hemenway at Harvard’s Center for the Study of Injury. 9. Help with the showing of Living for 32 at the Michigan Oct. 2011? Work with Michigan Peace and Interfaith Council for Peace and Justice. 10. Get Mayor Schrieber in Ypsi, Mayor Hieftje and Mayor Driskell from Saline to join MAIG. Fall of 2011. 11. David Hemenway agrees to come in Sept. 2012. Speak at St. Joe OB and UM IM and a public lecture. 12. Make contact with Genesee Co Med Soc. April 2012. No reply. 13. Go to MSMS to leaflet our flyer. May, 2012. 14. Write an article for Wash Co Med Soc. Oct. 2012. 15. Write Letters to Editor. Several Journals in Dec. 2112. 18. Grand Rounds U. of Michigan Family Medicine. Guns, Violence, and Public Health. Dec. 2012. 19. Public Health Committee of MSMS on Gun Violence and the Physician. March, 2013. 21. Presentations to Medical Students and Residents at UM, WSU and St. Joseph Mercy Brighton 2011-2014. 23. 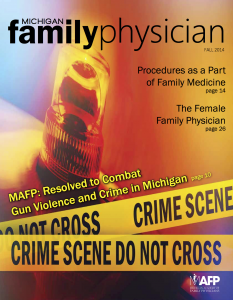 Successful Resolutions to Michigan Academy of Family Physicians in July 2014 on Gun Violence. 24. 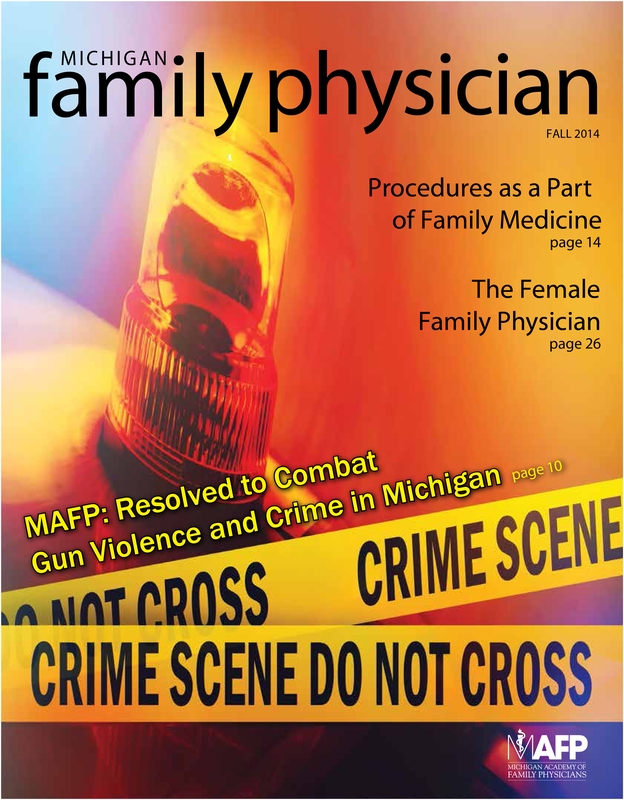 MAFP Family Physician Cover story on the Resolutions and PPGV efforts. (Nov/14). 25.Partial adoption of Resolutions at AAFP Congress in October, 2014.